Joy, of the Joint Christian Council, believes the problem can be solved to a great extent if the state government enforces the Kerala Panchayat Raj (Burial and Burning Grounds) Rules of 1998. "What is happening now is that many churches have made cemeteries into money-minting machines and charge exorbitant amounts from the faithful for burial space. The rules say only panchayats are empowered to make laws on levy of fees for burning or burying corpses but they are never enforced because of vote-bank politics." 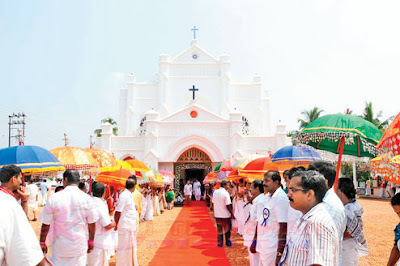 Thiruvananthapuram, July 16: Some church officials have dismissed it as a celebrity-fuelled controversy but the bereavement of actress Priyanka Chopra last month has revived a debate on faith and the right of the dead that has a close parallel in 19th century Bengal. Shortly before her death in June, Mary John, Priyanka's maternal grandmother, had expressed her wish to be buried at St John's Church in Attamangalam in Kottayam district. But the church turned down her wish, saying she was no longer a member of the parish. The officials concluded that as Mary had stopped living the Christian way - a matter her family disputes -no place could be found for her in the cemetery where her ancestors lay buried. Mary, or Madhu Jyotsna Akhouri after her inter-faith marriage, is one more addition to the "list of sufferers" and a victim of what critics say are attempts by the clergy to keep the flock "in check by intervening in matters related to their birth and death". A Jacobite Sryian Christian born in Kottayam, Kerala, Mary had married former Bihar Congress leader M.K. Akhouri while working in the eastern state as a nurse. "The question is not whom she married, but that she didn't follow the matrimonial sacrament (a marriage ritual), which is as important as baptism for a Christian. By refusing to do it according to church rules, she has voluntarily broken all ties with it,'' Abraham Kalliparambil, a church trustee, told The Telegraph. Matrimonial sacrament is done in churches, which means both the groom and the bride have to be Christians. So, Akhouri, a Hindu, would have had to convert to Christianity for a church wedding. The church committee did not change its position despite her family's assurance that she practised her religion even after marriage. The controversy forced a sympathetic bishop to intervene and, finally, Mary was buried in another church of the same order some 50km away. "The act of the church was awful," Priyanka later told the news agency ANI. Retired Supreme Court judge K.T. Thomas called the confrontation regrettable. "Cemeteries are usually reserved for parish members. If you start burying outsiders, there will be a problem of space. But in Mary John's case, she was a parish member and I don't agree with the stand that she ceased to be one because she married into another community." While puritans ask how a family's word can be taken about her being a practising Christian, others insist such rigidity is out of place for a community that is spread far and wide. Will the same church deny someone a burial if his or her body is brought back from a country where there was no church of the denomination, wondered a church-goer who did not want to be named. Mary's case has a precedent in Bengal, where David Hare, the Scottish watchmaker and philanthropist who founded the Hindu College (now Presidency University), had to be buried on land he had donated to the college. In his book White Mughals, author William Dalrymple says Hare was "denied a Christian burial when he died of cholera, on the grounds that he had become more Hindu than Christian". In Attamangalam, church officials played down the row over Mary John, saying it made headlines only because Priyanka was a celebrity. Others say there are many who suffer in silence for fear of annoying the clergy. "Denying sacramental rites to detractors has been an age-old practice in the church to settle scores," explained C.I. Issac, a historian and member of the Indian Council of Historical Research. "Earlier there used to be what was called rogue pits, dug on land immediately outside the main cemetery, to bury those branded as heretics and those who had committed suicide.... Those buried in rogue pits were denied the sacramental rites a Christian is entitled to upon death. It was the greatest insult a Christian could be subjected to." Among those who ended up in such pits was Malayalam litterateur M.P. Paul in 1952. Paul, a torchbearer of the progressive literature movement, had challenged the orthodoxy of the church. With time, the rogue pit became a thing of the past but what followed was a more "plebeian" form of boycott - as in the case of Mary John. Malayalam film director Ranjith recalls the case of Augustine, a popular actor who died in November 2013 in Kozhikode district. His dying wish was to be buried in the same church where he had been baptised. "While his body was still in the freezer, we conveyed the wish to the vicar concerned who declined saying Augustine used to visit Hindu temples," Ranjith wrote in a Malayalam daily. With the number of "sufferers" increasing, some among the faithful did fight back. They took the help of the law to "enforce their rights", said Reji Njallani, convener of the Kerala Catholic Reformation Movement. "In 1996, a local court ordered the Syro Malabar Catholic Church bishop in Kottayam to pay Rs 2.25 lakh to the family of V.K. Kurien Vellayiparambil for denying him burial in its cemetery. As a member of a university senate, he had refused to help a nun who was allegedly found indulging in exam malpractice. Kurien had also criticised the local priest for saying Indira Gandhi's assassination was God's punishment for favouring birth control and abortion laws. The case was later settled out of court," Njallani said. V.K. Joy, secretary, Joint Christian Council, a confederation of Christian organisations fighting for greater accountability within the church, said the court ruled that every individual had the right to a decent burial. Njallani cited another case where, in February this year, a munsiff court in Kottayam had fined the Church of South India (CSI), a Protestant denomination, Rs 9.95 lakh for refusing a proper burial to its former office bearer C.C. Jacob. The retired history professor had been excommunicated after he wrote a book in which he contended that individuals should take decisions on baptism only after they had grown up. "When he died in 2013, he was not allowed a burial in the family tomb, following which he was laid to rest at his home," Njallani said. The fee for burial space is also a subject of discussion. In Thrissur district recently, the Syro Malabar diocese issued a circular fixing the price of a family vault at Rs 1.2 lakh. Those who already owned a family vault were required to pay Rs 60,000 for burying a new corpse. This was challenged in court by a parish member who had bought a vault in 1994 for Rs 25,000. The court upheld her challenge and ordered that she needed to pay only a burial fee of Rs 750. Paul Thelekkat, spokesperson for the Syro Malabar Church, agrees there are deficiencies. "There may be rich people who seek tombs for their family or certain individuals. But for an ordinary person, burial is to be done without much economic expenses," Thelekkat said. "An egalitarian outlook has to be maintained, at least on matters after death on earth, leaving the rest to God's judgement."